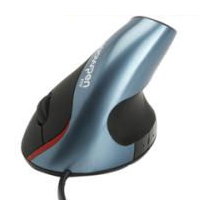 The CST3645 Vertical Mouse allows the hand to adopt a nearly vertical (approximately 60°) hand position while mousing. The unit has raised 'ridges' where the hand and thumb make contact with the mouse to prevent pockets of heat from forming when using the mouse for extended periods of time. 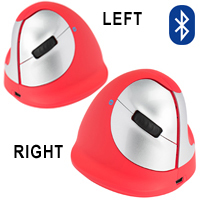 The thin contoured left and right click buttons are on the right side of the mouse (with a clickable vertical scroll wheel nested between), and two convenient thumb buttons perform Back and Forward actions. There is a dpi toggle on top of the mouse to adjust between 600, 1000 and 1600 dpi. 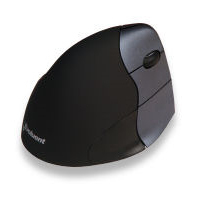 A removable palm support 'surround' at the rear of the mouse prevents the edge of the hand from dragging on the surface when moving the mouse, encouraging mouse movements to be made with the entire arm. The Superior-X driver is available to allow reprogramming of all the buttons. The Penclic Mouse from Penclic is an elegant precision mouse using a 'pen-shaft' design to make moving your cursor as easy as writing with a pen. Mouse buttons are on the pen-shaft for quick access, while there is a scroll wheel on the base. Available in wireless or corded models. 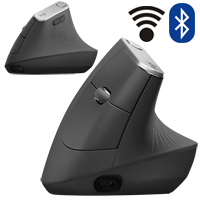 The Rockstick Mouse offers an ingenious alternative to address the single most repetitive activity while using a computer - generating left mouse clicks. Instead of clicking a button, the user need only 'rock' the 'stick' portion of the mouse (tilting it slightly to the left for a left click, and to the right for a right click). Finally, users can mouse without lifting a finger! This makes this mouse a potentially good alternative for individuals with trigger finger, arthritis, or anyone who has difficulty clicking when using the mouse by allowing individuals to use the muscles in their entire hand to click instead of being limited to the strength and endurance of a single finger. The base of the mouse supports the hand and provides control of the mouse without the need to 'grip' the mouse. The vertical orientation of the Rockstick also eliminates pronation which is the rotation to a palm down position which for some people can also lead to discomfort while mousing. At the top of the stick is a vertical scroll wheel which can be clicked to generate middle clicks. The Rockstick Mouse comes in two sizes, a Small/Medium size and a Large size, and is corded. La Rockstick Mouse offre une alternative ingénieuse pour adresser l'activiter du répétition unique pendant l'usage de l'ordinateur - générer les clics gauche du souris. Au lieu de faire le clic avec un bouton, vous avez seulement besoin de faire un mouvement "rock" the "stick" du souris (la pencher ce portion du souris légèrement à la gauche pour avoir un clic gauche, et la pencher à la droite pour avoir un clic droite). Finalement, vous pouvez bouger une souris sans lever un doigt! Cela donne cette souris une alternative potentielle pour des gens avec des mal douleurs trigger finger, ou l'arthrite, ou n'importe qui qui a de la difficulté a faire un clic avec une souris en utilisant le muscle dans le tout de la main pour faire le clic au lieu d'être limiter de force et endurance d'un doigt seul. La base du souris support la main et offre le control sans le besoin de serré la souris. L'orientation vertical du souris Rockstick vient en deux tailles avec fil, un petit/moyen et un grand. The Wow-Pen Joy Mouse from Waawoo Industries is a right-handed optical mouse designed to keep your hand in a vertical position. 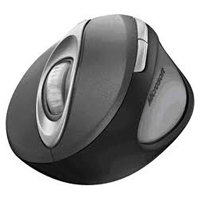 Its compact design includes a side scroll wheel, five buttons, and an inside groove to rest your thumb while mousing. 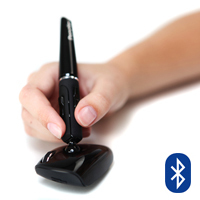 The sensor resolution is 800 dpi and weights approximately 4.6 oz (130g). At the moment, black model is on back order. NOTE: We do not offer any warranty or customer satisfaction guarantee on this product. 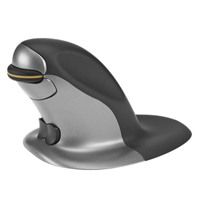 Soft-touch materials and an ergonomic design fit your hand as naturally as a handshake - somewhat similar to a vertical mouse, but with less support of the hand. Features include an open window selector (accessed through the scroll wheel button), 4-way Vertical and Horizontal Scroll with Tilt Wheel Technology and Magnifier software - point and click to enlarge and edit detail using the Magnifier. All 5 buttons are customizable with the installation of the driver. Note this product uses RF (radio frequency) transmissions to make it wireless. 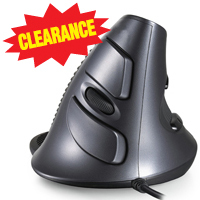 This product is discontinued, the recommended replacement is the Microsoft Wireless Laser Mouse 6000 (QVA-00003). This is a wireless version of the popular Evoluent VerticalMouse 3. It uses a 2.4 GHz wireless method of transmission with a 30' range and estimated 3 month battery life. 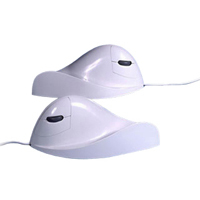 This wireless model features a fixed 1200 DPI optical sensor and has the same shape as the corded model. At present the wireless unit comes in a right-handed model only, with a black housing and smoke (dark silver) buttons, and comes in environmentally-friendly packaging. This model has been discontinued by the manufacturer.